The Cakewalk became a popular stage act for expert dancers as well as a craze in fashionable ballrooms at the turn of the twentieth century. Couples formed a square with the men on the inside and stepping high to a lively tune, strutted around the square. The cakewalk originated among American Black slaves who, often in the company of their masters, used the dance as a subtle satire on the elegance of white ballroom dances. It contributed to the evolution of later American and European dances based on jazz culture, rhythms, and that musical influence on the growth of ragtime. Ruth (Rudy) Walker [b.1891 – d.1928] and her little brother Frederick (Fredy) Walker [b.1893 -d.1977], known as The Walkers, song and dance entertainers and actors, were both born in Chicago, IL. It appears that at some time in 1902 through 1908, the two dancers, traveled to Europe in the company of their mother, Ella Walker, herself an artist, born in Chicago (circa 1860s). 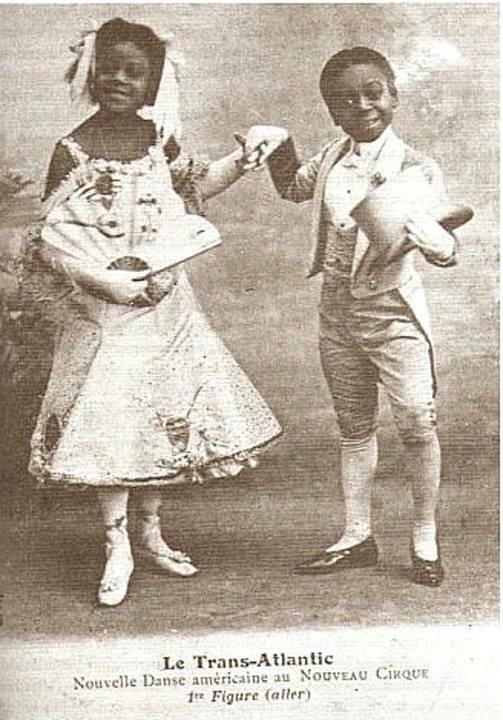 Billed as “Les Enfants Nègres,” their presentations of the cakewalk dance attracted a lot of attention at the Nouveau Cirque at Paris and paved the way for a long career in Europe. They became so popular that they inspired a composer, a sculptor and a movie film director, as well as cartoonists. This entry was posted in Uncategorized and tagged African fashion, Liberian Fashion, The Cakewalkers, Zabba Designs. Bookmark the permalink.